Exclusive: As part of The Quad's upcoming Goldblum retrospective, the still-timely look at an alt-weekly on the skids gets a fresh restoration. “Have I ever missed a deadline?” “Constantly.” Over forty years after making its debut, Joan Micklin Silver’s sophomore feature — following her low-budget 1975 historical drama “Hester Street” — “Between the Lines” is more timely than ever. The zippy, lived-in dramedy chronicles the intersecting lives of a pack of staffers at a Boston alt-weekly that’s already full of drama before it kicks into its central plot: what happens when the paper seems destined to fall prey to a corporate takeover. As the staff grapples with the possibility that their lives (and livelihoods) are about to be forever changed, the film digs into plenty of still-intriguing ideas about the responsibility of the press, what it means to grow up, and how to hold on to your youthful zest when real-life responsibilities won’t stop calling. The 2K restoration of the film will have its New York premiere on Friday, February 22 at The Quad, which is screening it as part of their upcoming Goldblum retrospective. That program runs February 8 – 28 and will include screenings of such other diverse Goldblum classics as “Earth Girls Are Easy,” “The Fly,” “Independence Day,” “The Big Chill,” and “Jurassic Park.” Check out more information about the program right here. 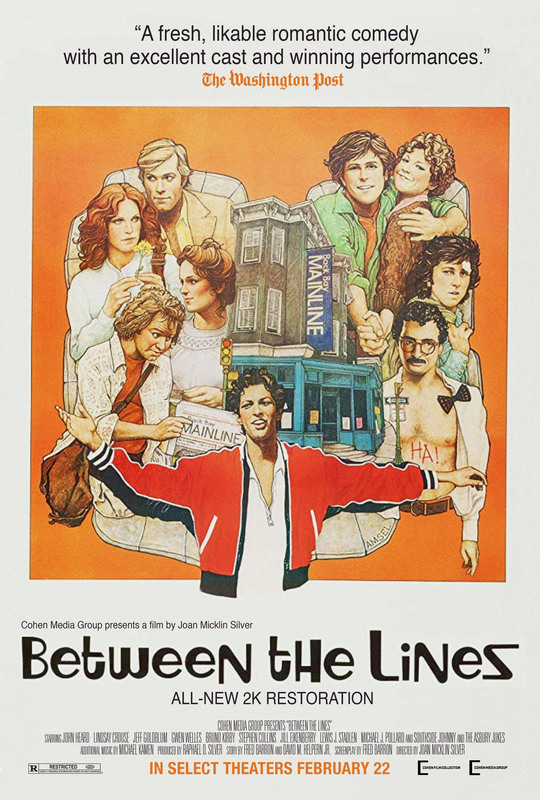 Check out IndieWire’s exclusive restoration trailer and poster for “Between the Lines” below.